I love recipes that are super quick and easy, and require little to no prep, but that are still super delicious. My good friend Hailey came up with the idea to use a bottle of salad dressing as a cooking sauce for her tilapia. I decided to give it a try myself, and I used the exact dressing she recommended…the Archer Farms Lemon Ginger Sesame Dressing from Target. I was amazed at how crazy good this recipe was!! The fish came out so moist and flaky, and the dressing made the perfect sauce for it…light and flavorful. Plus, it was so fast to prepare. This will definitely become one of my go to Weight Watchers Fish Recipes for when I want to get a healthy fish dinner on the table quickly, with no fuss. And each serving is just 6 Points! Pair this with a salad or some roasted vegetables, and you’ve got the perfect low calorie dinner. Thanks Hailey! A quick, easy and delicious dinner recipe that you can get on the table in 20 minutes. This no prep recipe is perfect for a hectic weeknight. And each serving is just 6 Points. Spray a large, nonstick skillet with nonfat cooking spray (I like the Pam butter flavored kind for this recipe) and set over medium high heat. 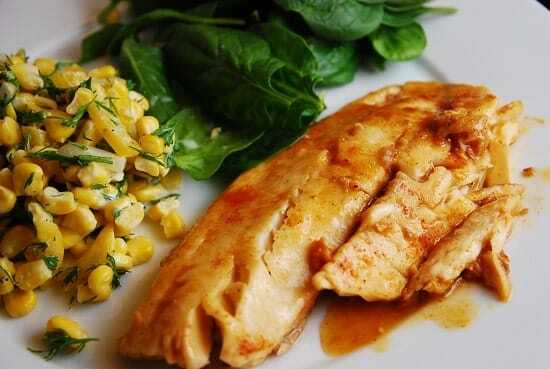 Season tilapia fillets with salt and pepper and place in pan. Sear each side of tilapia for about 3 minutes. Then turn heat to medium. Pour in the entire bottle of salad dressing. Cover and let cook for about 15 minutes, or until fish is cooked through, making sure to occasionally spoon dressing over fish while cooking. Ahh I was just in Fresno (where they have Target stores) on Sat. wish I would have known. I will be sure to add the dressing to my list. I have some Basa fish that I bet this will be great with. TY for the recipe.